New Winter 2018: This fabulous beauty is a creation from the Christopher Radko studio, one of its series of elegant ladies in rich attire. The passion for pink Radko Christmas ornament stars a leggy gal eight inches tall and dressed "to the nines" in an outfit that resembles something from Miuccia Prada or Domenico Dolce. All the materials, the European blown glass, lacquer finish, outfit and feather are of the highest quality to create a gorgeous, durable piece that is one of a kind. You'll find similar Radko designs from Russell Rhodes to create a magnificent collection. 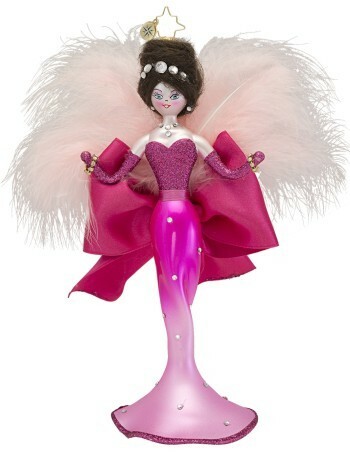 Select something unique for yourself or a friend this season with the pink gown lady Radko ornament.